Debt is an issue that people in Ireland are all too familiar with. Whether personal debts or sovereign debts, as citizens we all have some experience of this problem and its effects. While the specific details of debt may differ widely between Latin America and Ireland, many of the mechanisms and effects are surprisingly similar. This has made debt a natural point of solidarity between Ireland and the Latin America. Until relatively recently, many people believed that only poor countries could be engulfed by debt, and much of the global focus was on areas like Latin America. In these protests, debates and discussions some of the most important terms in the debt movement were coined, terms which would later be used much closer to home. Odious debt is one important example, used to describe debt accrued by a government acting in contrary to the will of the people. Many such arguments were made to lobby powerful governments in the early 2000s, leading to some high-profile debt cancellations. As we all know, just a few years later debt once again beaome a huge economic and political force, this time in the Global North as well as the Global South. 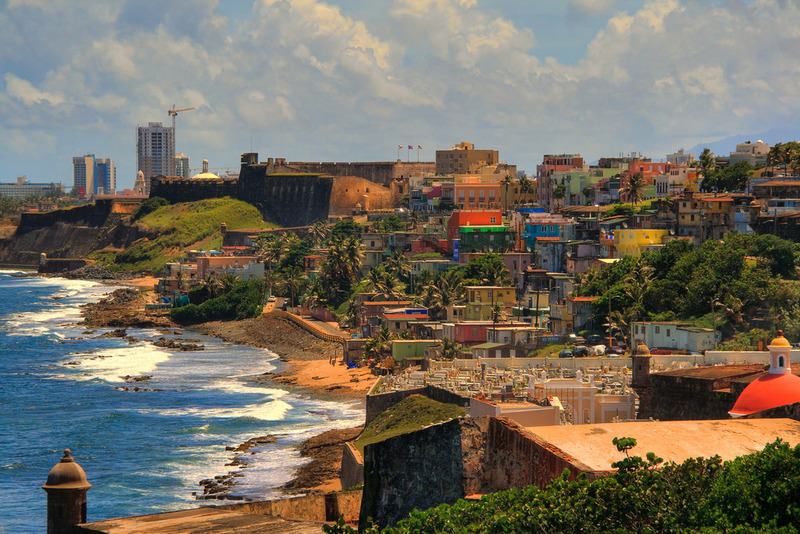 The Puerto Rican capital, San Juan, is fringed by slums like La Perla, pictured above. Photo by Christopher Rose. These similarities are particularly visible in countries like Ireland, which was wracked by a debt crisis from 2008, and Puerto Rico, which is currently undergoing a dire crisis of its own. Puerto Rico’s downturn began with its 2006 budget crisis, and has seen its total debt reach 70 billion US dollars, roughly 70% of total GDP. Much like in Ireland, the response to this crisis was vicious austerity, and the results have been much the same. Public sector cuts have sent unemployment soaring, decimated healthcare and education services, and sharply increased the tax burden of ordinary Puerto Ricans. Poverty rates have reached 45%, resulting in a mass exodus from the island that has seen almost 10% of the population leave its shores since 2000. Puerto Rico has been particularly hard-hit by this crisis largely due to its relatively low autonomy – in fact it could even be considered a colony of the United States, whose citizens have no presidential voting rights and limited say in their own affairs. These issues have only intensified since the crisis. When the Obama administration signed the controversial PROMESA bill into law in June 2016, control of the island was handed off to a federally-appointed junta, leading to mass protests criticising the anti-democratic, neo-colonial aspects of the act. 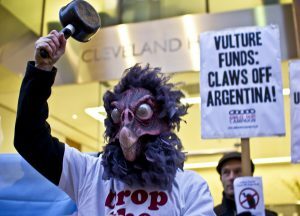 Much like in Ireland, vulture funds (so-called because they pick through distressed debt for profits) have also made headlines throughout Latin America. Because vulture funds do not have to worry about customer service or their social impact, they often use extremely ruthless tactics to eke profits from the debts they purchase, such as seizing properties and evicting their residents and waging lengthy legal battles. Nowhere in Latin America have the vultures made a bigger impact than in Argentina. 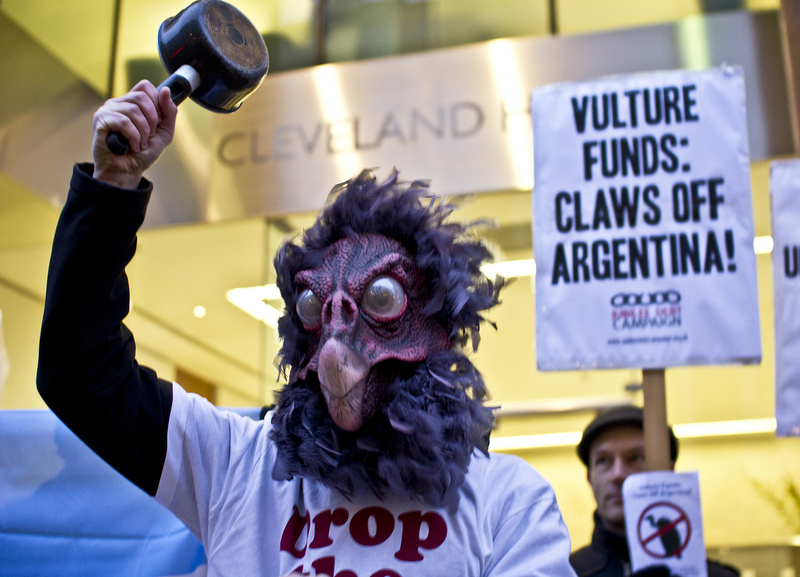 Argentina’s battle against the vulture funds drew a huge amount of international support. Photo by James Robertson/Jubilee Debt Campaign. In many ways, Argentina’s debt is a prototypical example of odious debt – accrued by military dictatorships as part of a vicious repression of political dissidents and worsened by IMF-imposed neoliberal reforms. As Argentina’s public debt skyrocketed to $144 billion in 2001, its economic crisis became a political crisis, and popular protests brought down the De la Rúa government. Argentina eventually defaulted its debt, declaring that it could not pay it back under its current terms, and began a process of restructuring. This process was hugely successful, placating over 92% of creditors. Those that refused the offer were referred to as “hold-outs”, and featured a slew of vulture funds. In a hugely important court case in 2013, NML Capital sued Argentina for the full amount of debt owed ($1.3 billion) in a New York courtroom, effectively deciding the fate of one sovereign state in a completely unrelated territory. In a move that shocked activists and legal experts, Judge Thomas P. Griesa sided with the vultures, and ordered Argentina to pay the full amount. Eventually in 2016, amidst criticisms that all debts owed were illegitimate and that the vulture funds had taken advantage, Argentina repaid all its debts in full. These patterns of austerity, external interventions, and vulture funds are ones that we know all too well. In fact, many of the same stories have happened in our own country, often involving the same actors. At LASC we firmly believe that sharing and understanding our own experiences is a hugely important step in building solidarity with those affected by debt in Latin America. LASC is a proud member and supporter of Debt and Development Coalition Ireland (DDCI), and together we have sought to raise awareness and invite greater participation in debt movements through hosting talks, development education initiatives, and learning circles.